Zion is full of amazing, fun hikes. It can be hard to choose which hikes to do. There are different hikes that seem to be at their “peak” at different times of the year. Since Spring is about here, we have decided to compile a list of our favorite Spring hikes. If you get a chance to get up above Zion Mt. Caramel Tunnel, you can experience a pretty rad hike. As you hike onward you will see pools carved into the rock, depending on how early or late in the spring you decide to go, the pools could be frozen sold or not. Twisted ponderosa pines and juniper trees set a stunning backdrop for this hike. This hike is best done from late spring through summer. This hike is located at the end of the shuttle line at the Temple of Sinawava. The cool thing about this hike is you can mke it as long or short as you’d like. Hike a little ways in, turn and go back, or hike the full trail. Heads up, you WILL get wet on this hike, so depending on how early or late in the spring you go, be sure you dress accordingly. Named one of the scariest and most dangerous hikes in the world, this hike takes you high up. Travel over narrow cliffs, narrow cliffsides and more. This hike is NOT for the faint of heart. 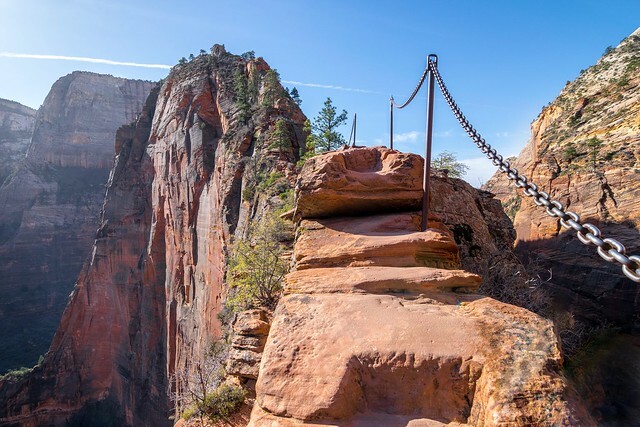 It is one of the most strenuous hikes in Zion. However, the reward at the top is worth it all.